Substituting random variables into your templates isn’t the most exciting (or useful) web programming technique, though it’s charming in its own way. In most cases, we want web sites to react to input from the site’s visitors in some meaningful way. Building on the last example, we can create a page which counts up to a user-supplied number. (Python is very good at counting, as it turns out). To do so, we’ll need some way to get input from a user, and use that to determine the behavior of the web page. Enter the query string. The query string is a set of parameters that can be passed to a web page by way of the URL by adding a ? to the end of the URL, and a series of parameter names and values separated by =. Multiple parameter name/value pairs are separated by an &, so a complete URL with query string looks like http://www.exmaple.com/?first_name=Dan&last_name=Crosta. First we check if the query string parameter “count_to” exists for this request (it might not, if the viewer didn’t click a link containing the query string, or if they did not type it by hand), and if it does, we set the variable count_to to have that value. After that, we convert the value to an integer (since integers are easy to count with), and move on with the rest of the page as before. However, if there is no “count_to” query string parameter, the test in the line if 'count_to' in request.values: will fail, and the program will jump to the else: block, and set a default value of 10 to count to. Since “10” is the syntax for expressing an integer in Python, we don’t need to convert it to an integer (as it already is one, and the conversion would do nothing). Congratulations, you’ve made your first bug! It turns out Python doesn’t know how to count to Bob (and neither do I, for that matter), but if you learn to read this output, it will point you to your error, which helps tremendously in the web development process. Just below the big “ValueError” heading is the exact error message: “Bob” is not a valid integer (well, we knew that). Now, no matter what value a user supplies for the count_to query string parameter, we know that our code will only try to count to it if it’s an integer (and in all other cases it will simply count to 10). By default, form submissions go to the same page as you are currently on, and store the input field values in the query string. This works well for small forms, or forms without sensitive data (since query strings are part of the URL and are logged by most web servers), but in many cases you will want to use a “POST” request, which sends the form data along side the URL, but not actually in it. You can do this by replacing “<form>” with “<form method="POST">” in the template. You can now load http://localhost:5000/ (that is, without any query string parameters), fill out the form, and submit. One annoyance you may notice is that if you attempt to refresh the browser after submitting a POST request, you will get a warning message asking you whether it’s OK to submit data again. The reasons behind this message are partly historical, partly practical, and entirely likely to start flame wars between web developers, and are best not addressed here. Regardless of your stance on the philosophical issues behind this debate, the agreed-upon best behavior is to receive a POST request, do some appropriate processing, and then redirect the user’s browser to a new page (this new page will be accessed with a normal GET request, which does not trigger the browser warning). In order to use this method in our counting example, we could redirect from the POST to a page using GET and the query string, but the point of using a POST request in the first place was to avoid the query string. Instead, we’ll create a page whose name itself is a parameter. 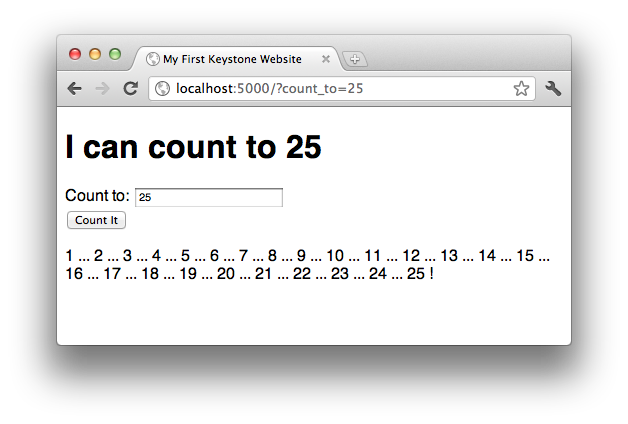 To do so, create ~/Documents/keystone/count/%count_to.ks. The “%” at the start of the filename indicates to Keystone that this page should match any URL request which gets to it – in other words, http://localhost:5000/count/25, http://localhost:5000/count/100, and even http://localhost:5000/count/Bob will all match. Inside %count_to.ks, the variable count_to will contain the (string) URL segment that matched (following the previous examples, “25”, “100”, and “Bob”, respectively). This is similar to what index.ks contained before, but rather than doing any counting, it simply generates the URL (e.g. “/count/100”), and sends a “SeeOther” (i.e. a redirect) message back to the browser. 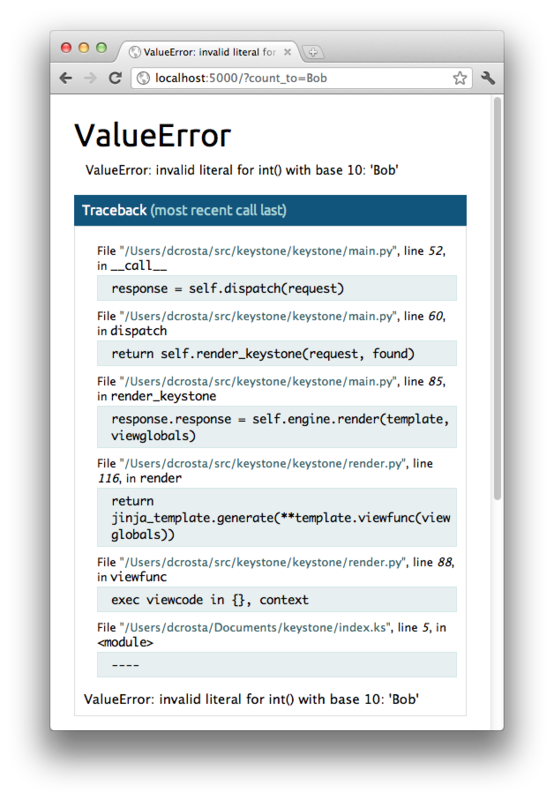 The raise statement here breaks the usual flow of processing the Python code then rendering the template, so that Keystone knows to send a redirect message to the user’s browser. Rembmer that the count_to variable is set based on the name of the file; if you had named the file %max_number.ks, then the variable count_to would have to be updated to be max_number in the Python section of this file. As before, we have to convert it from a string to an integer, and have a default value on hand in case it cannot be converted.